On the 5th (Wed), explore the wealth of natural beauty at Cape Breton Highlands National Park. 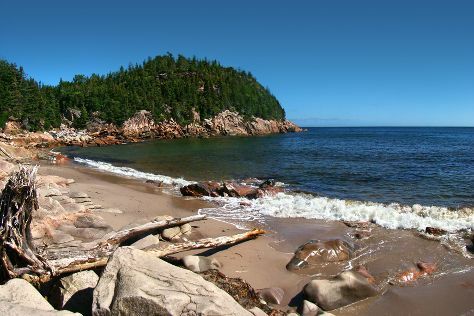 Get ready for a full day of sightseeing on the next day: admire the sheer force of Chutes Mary Ann Falls, then enjoy the sand and surf at Ingonish Beach, and then hike along Middle Head Trail. To see more things to do, reviews, traveler tips, and tourist information, refer to the Ingonish vacation builder. Toronto to Ingonish is an approximately 6.5-hour combination of car and flight. Due to the time zone difference, you'll lose 1 hour traveling from Toronto to Ingonish. In July, Ingonish is little chillier than Toronto - with highs of 27°C and lows of 15°C. Cap off your sightseeing on the 7th (Fri) early enough to travel to Baddeck. Kick off your visit on the 7th (Fri): paddle through the water with a kayaking and canoeing tour, then don't miss a visit to The Water's Edge Gallery of Fine Art & Crafts, and then take an in-depth tour of Alexander Graham Bell National Historic Site. 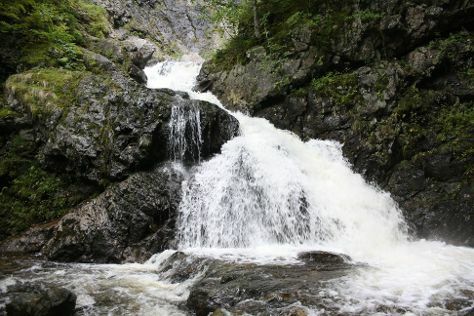 Get ready for a full day of sightseeing on the 8th (Sat): admire the sheer force of Uisge Ban Falls, find your balance on the water with some of the best stand-up paddleboarding in the area, and then steep yourself in history at Highland Village. To find ratings, reviews, maps, and more tourist information, read Baddeck travel itinerary planner. You can drive from Ingonish to Baddeck in 2 hours. Plan for little chillier nights when traveling from Ingonish in July since evenings lows in Baddeck dip to 9°C. Wrap up your sightseeing on the 9th (Sun) early enough to travel to Louisbourg. Louisbourg is an unincorporated community and former town located in Nova Scotia's Cape Breton Regional Municipality.HistoryThe French military founded the Fortress of Louisbourg in 1713 and its fortified seaport on the southwest part of the harbour, naming it in honour of Louis XIV. On the 9th (Sun), enjoy the sea views from Louisbourg Lighthouse, contemplate the waterfront views at Bras d'Or Lake, and then stroll through Black Brook Beach. Get ready for a full day of sightseeing on the next day: enjoy the sand and surf at Kennington Cove Beach and then steep yourself in history at Fortress of Louisbourg National Historic Site. To find reviews, other places to visit, photos, and other tourist information, go to the Louisbourg itinerary planner. You can drive from Baddeck to Louisbourg in 1.5 hours. Traveling from Baddeck in July, you can expect nighttime temperatures to be a bit warmer in Louisbourg, with lows of 15°C. Wrap up your sightseeing on the 10th (Mon) early enough to travel back home.